One after another, the debut issue quickly introduces all the characters to the reader. They are all either engaged in combat, or just trying to get by without getting involved in someone else’s business. What struck me was that it appears Scarlet Spider is going to be a part of the team here. He’s not a character that I’ve read about before, outside of that Minimum Carnage #1 issue I read sometime last year, so it was interesting to see how it looks he might be joining the team. And he has a demi-goddess with him who can play on emotions and influence them, so they make for quite an unlikely pair. I gotta say that after reading his panels here, I’m very much interested in reading his stand-alone series, which recently ended I believe, or is going to soon. Should be fun. The other characters are intriguing as well, especially the Salem’s Seven and the duo of Speedball and Justice. They start off fighting each other due to some misunderstanding, but then get over it. Its all ended rather quickly and I would have liked to see that aspect explored further, but I’m also glad that Yost didn’t linger on it for too long. The characterisation can come off as being a bit thin, especially when there are so many characters involved, but I’m fine with it for now since this issue was clearly meant as a brief introduction and I expect future issues to build on this further. The final members of the team are Nova aka Sam Alexander and Faira Sar Namora of Atlantis. I could be wrong about this but I think she is Namor’s daughter? Or could be a niece or sister even I suppose. Both these heroes get quite an action entry in this issue, and I find that I’m very curious how their particular subplots are going to play out. I can kind of guess how the later with work out, but with Nova I’m definitely interested. I tried reading his solo series when it was relaunched for Marvel Now, but couldn’t really get into it. I was just bored. Hopefully this series can give me reasons to stick around. 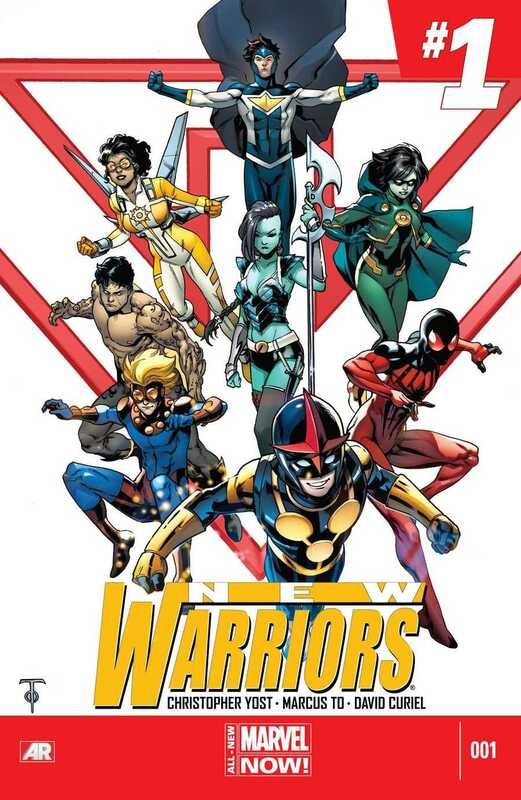 The overall mystery that is going to bring these heroes together to (re)form the New Warriors team isn’t all that interesting. It is kind of a trope of superhero comics and I would have preferred something more substantial, but like I said before, still early days, and this is just the first issue. I’m open to seeing how things develop in the next few issues. On the art side, we have Marcus To on pencils with David Curiel on colours and VC’s Joe Caramagna on letters. For the most part, the art was fine. A bit barely serviceable in a few places, but overall it is decent. There aren’t that many details in a lot of the panels however, and mostly they are just the characters firmly in the foreground. And To’s pencils can be a little thick in a few places as well, but I didn’t mind it all that much. The story makes up for the deficiencies in the art I think. And I liked the bright cheery side to the art. The story is a bit grim, but the colours help in breaking that monotony. Overall, quite a decent issue. I went in with zero expectations and I was pleasantly surprised. And its nice to see at least some POC representation on the team. That is all too rare these days. Posted on February 24, 2014, in Comics Reviews, Review Central and tagged All-New Marvel NOW!, Atlantis, Christopher Yost, Civil War, Comics, Comics Review, David Curiel, Devils, Faira Sar Namora, Hummingbird, Justice, Kaine, Marcus To, Marvel Comics, Marvel Now, Mutants, Namor, New Warriors, Nova, Nova Corps, Review, Review Central, Salem's Seven, Sam Alexander, Scarlet Spider, Science Fiction, Speedball, Superhero Team-up, Superheroes, Teen Superheroes, Urban Fantasy, Urban SF, VC's Joe Caramagna, Witches. Bookmark the permalink. 3 Comments.